In this city of many students, it a huge housing shuffle takes place every year, this time of year. Two of my sons are moving, and I have gotten involved in the process. I want to tell them to be careful what they carry into their new abode, to do-as-I-say-not-as-I’ve-done, and avoid accumulation. But, throwing my imagination back to those early adult years, I can recall the joy of adorning my dorm room with something new. Something I’d chosen, or been given by a new friend. Something that made me feel like I was becoming a new person, and something that made me feel connected to history and grounded in a shifting present. The Morris chair was one of those things. My college yearbook shows me sitting in it, and I can hardly imagine now how I transported it through annual dorm changes and multiple moves. Family lore said it accompanied my father to college in the ’30s, a gift from an older relation. And it is probably older than that, perhaps over a hundred years old now. Somehow it remained with me over the years: a bulky oak construction of mission-style design. For the last fifteen years or so, it sat in my basement. The cushions meandered off to join some other seating arrangement, and boxes piled upon the sturdy oak. I might have made room for it upstairs, but for the fact that there is already more furniture there than a pair of empty nesters can employ. Why is it that it seems important to keep this piece in the family? I suppose all those episodes of Antiques Roadshow had something to do with it: when stories of provenance are lost, some value disappears. But I was reluctant to suggest that one of my sons adopt this one. Somehow, I don’t think they’re likely to remember the details, or to care for it as much as I do. So it has gone to my sister’s place, where hopefully someone from the next generation may form an attachment to it. 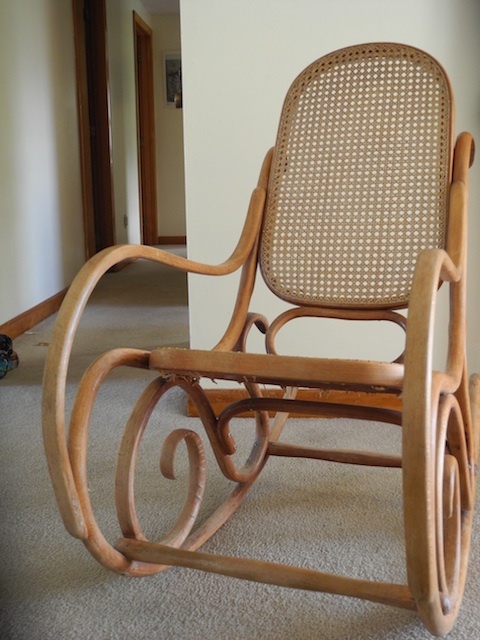 My father gave me a Thonet bentwood rocker as my college graduation present. It is an amazing piece of furniture. The wood and the caned back and seat have a light finish. Its frame bends like a bow into a perfectly balanced semi-circle. When I sit in it I feel suspended in mid-air. It was a ridiculous gift to give to any early seventies fine arts graduate designed for many years of transient living arrangements. Its elegant lines and wide rockers took up most of the floor space in any living room, it was awkward to pack any of the many times I moved – too delicate to have things piled on top of it, too big to fit in any backseat or trunk ( believe me, I have tried), too aerodynamic to place at the top of the load. Its caned seat proved, over time, to be vulnerable to the assault of boy bottoms (as it was the chair of choice for them to aggressively flop into) I keep moving the chair around trying to find the perfect spot.It most recently found a place on my sunporch until I realized that the heat and sunlight was drying out the wooden frame and so it now perches at the edge of my living room where it takes up more than its share of space.